Football season has returned, and if you are tuning in to watch the kickoff games this season, you may notice freshly painted field markings and team logos at center field or in end zones. Did you know that parking lot painters (like us!) can also apply field paint? Line marking machines used to stripe your lot for safety and efficiency can also be used for leisure activities (sports facilities). Specific field markings are used in football, basketball, baseball, track & field, golf, etc. If your field lines are not accurately marked, it can really throw off a game. Having a custom painted logo at center field is a great way to give your field a professional look. However, painting lines and/or a logo on a field is no easy feat, and it’s important that it is done right the first time to avoid smudging, inaccuracy, safety concerns, and quick fading. 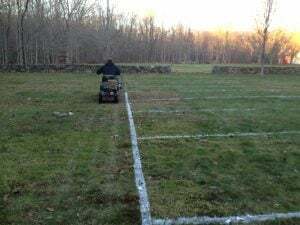 When planning your field paint project, you’ll need to consider dimensions, zones, goals, and other necessary specs in relation to the specific sport/activity. If your facility is the home field for several sports, field markings for each sport played here will need to be marked, which can make things even more confusing (like a high school football field that is also used for lacrosse games). Each area and line will need to be carefully measured and will have to meet standard guidelines. 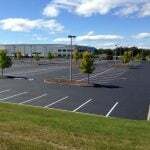 Maintain & Clean The Field First – Like parking lot paint preparation, making sure that your field is cleaned, mowed, and properly maintained before field paint is applied is very important. A well-maintained grass, court, or turf surface makes painting easier, quicker, and allows for better accuracy. Check The Weather – Weather conditions are important when it comes to any striping job, and field paint is no different. Making sure that conditions will be dry before, during, and after your painting project is key in ensuring the paint takes and dries properly. The Right Equipment For The Job – It may be tempting to make your own stencils and apply your own field paint, but without the right equipment, your paint job will likely be inefficient and unappealing. 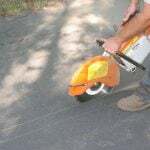 Using a professional line striper will ensure that the proper equipment, and techniques are being used. Hiring The Right Team – Since you can easily find videos all over the internet with DIY field painting tutorials, it is easy to consider doing your own field paint project. But, line striping of any kind really is not the easiest of DIY jobs. 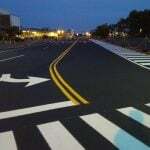 Finding enough man power, the right equipment, ensuring accuracy, and aiming for longevity are key items to concur in order to guarantee a successful striping job. If you are choosing to recruit a team of friends for your field paint job, be sure your team has enough players to get the job done. 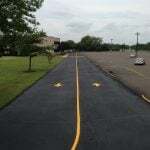 EastCoat Pavement Services can not only handle your striping needs for your asphalt parking lot surfaces, but also your running tracks, football fields, soccer fields, tennis courts, playgrounds, and other athletic surfaces. 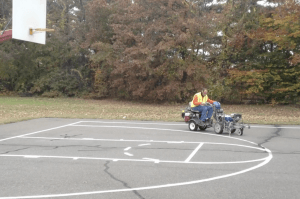 As line stripers, we know that striping projects are not as easy as they may seem, and we understand how precise these markings need to be for both accuracy and aesthetic purposes. Additionally, these projects cannot be done without the proper equipment. Save your DIY time for simpler projects, and let us help you accurately and beautifully mark and customize your team fields! Contact EastCoat Pavement Services for your free consultation today, and let us properly prepare your fields for the new season!